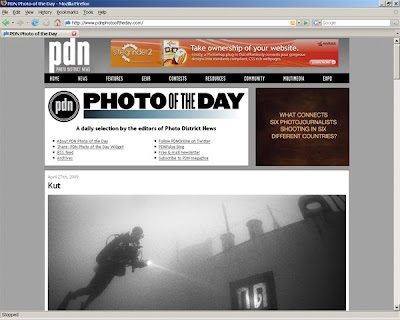 The editors of Photo District News have graciously selected my underwater photograph "Kut" to be their PDN Photo of the Day for Monday, April 27th, 2009. PDN Photo of the Day displays photographs selected by the editors of Photo District News, a publication for photo professionals. Permalink to "Kut" at PDN Photo of the Day. Thanks to Daryl Lang, Editor PDN Photo of the Day.